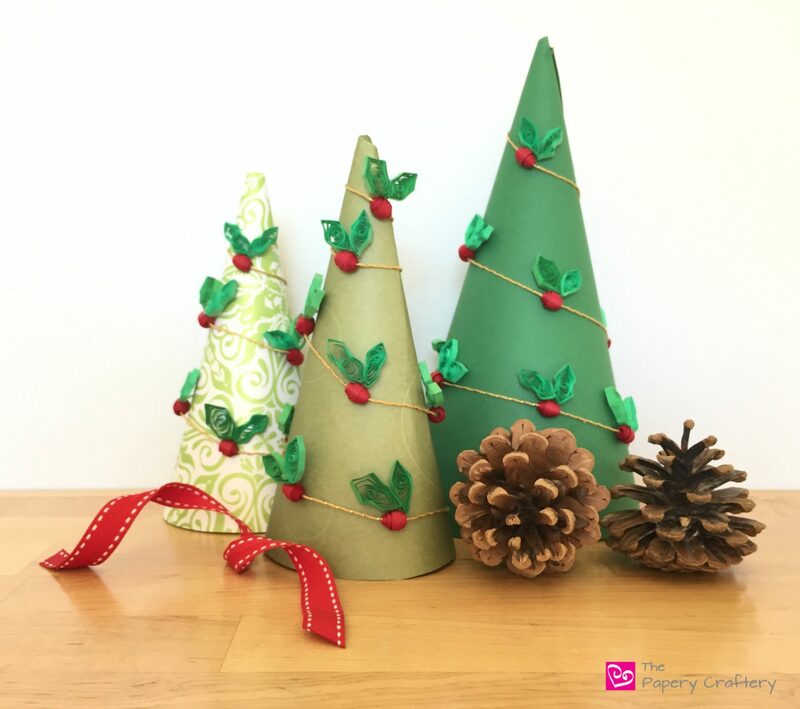 This year, the big thing in Christmas decor seems to be paper cone trees. I’m seeing them in red, in gold, snowy and covered in glitter. So, of course, I had to do my own version and add some quilling! I whipped up some quick quilling paper holly berries and leaves, strung them on gold twine and wrapped them around green paper cones. Most of the materials for this paper holly garland are basic quilling supplies. I used crimson red paper for the berries and meadow green for the leaves. Plus, a couple tweezers, a ruler, glue, and some toothpicks. I also chose a bright gold twine with a little sparkle for stringing the holly, once they’re made. I really wanted to be able to string my holly garland with twine on a needle, while keeping the berries as a 3-dimensional shape. So, I started with the same approach that I used to make the flower buds in my daffodil tutorial. After a little trial and error, I realized that I needed to keep the center hole in my coils large enough to be able to pull the needle through, and that rolling on my needle tool was not going to work. The hole left was just too narrow. But rolling paper on a toothpick worked perfectly. Each berry is formed from a 10″ strip of red quilling paper, and a 6″ strip. Roll each strip into a tight coil around a toothpick, and glue the end to secure. Push the center of each coil to make a dome, using any small rounded object. I found the cap to my glue bottle left a nice shape. Pen caps or rounded pins could work, too! Lightly brush the inside of the dome with some glue so it maintains that shape. With a little more glue, join the two domes together to make a 3-D berry! You can see that most of my berries are not, in any way, perfectly round, but I think that is part of their charm! Now, the holly leaves were a little tricky for me. But, thanks to the wonderful quilling community out there, I was able to piece together some tutorial posts into something that worked nicely for me. I made two different size leaves for my quilling paper holly: 10″ and 12″. For each leaf, roll a coil on your quilling tool. Gently form a marquise shape by squeezing each side of the coil into a point. Next, form the other 4 points on the holly leaf. Holding the center of the marquise with one pair of tweezers, use a second pair of tweezers to bend the quilling paper towards the first tweezers to form a point on either side, top and bottom. The result will make 2 points on each side of the leaves with a dip in the middle, for a classic holly leaf shape. Each berry will need two leaves. Try gluing them on an angle for a little more realistic look! It’s time to string your garland! Since I rolled my holly berries around the toothpick, the hole in the center was large enough to thread a needle through. Using the needle definitely made the stringing process go really quickly. I just free-handed them, but I’ve found that the tutorial on The DIY Mommy was really helpful in understanding the basic forming technique. After rolling a few different green cone trees, I wrapped my quilling paper holly garland around each one. To keep them steady, I used cellophane tape to attach each end of the string to the back. If you are looking for a more permanent holiday decoration, hot glue each holly berry to the cone where it falls. I think this quilling paper holly garland would be adorable on snowy white cone trees, too! What do you think about quilling garland for the holidays? Yay or nay? I haven’t done any quilling in a long time. Love this tree. Will have to pick it up and start again. That’s wonderful! It’s such an fun craft, and I’m so glad you might start again! This is such a gorgeous craft! I’ve always been a little intimidated by quilling, but I’m not sure why. Holly is one of my favorite decorations of the season, so I’m going to try this! You know you can do this, Jessa, and if you have any trouble or questions, ask away! WOW! This looks so beautiful! I’ve never done quilling, but with my love of all things paper, I can see I’d totally love it! Thanks so much, Samantha! I hope you’ll give quilling a try soon! Meredith, you are so talented and creative! I’ve never done quilling before, so I found this post inspirational. Thank you so much for sharing your homemade holiday decor. These cute little trees are super festive! Wow, that’s so kind of you! You’ve made my whole day with your sweet comment! Thanks so much for stopping by, Morgan! Yay for affordable, right? And they’re super-quick too! This looks like such an awesome craft! Thanks Rachel, I hope you’ll give it a try! Oh, this is the first time I’ve heard of paper quilling. This is a lovely technique! And your holly and berries are super cute, too! Thanks Jennifer! I’m trying to spread the word about quilling, one project at a time! Wow! looks so lovely! and boy do you have to have patience when you are doing this craft! Love the end result! These look great! I love DIY projects. Pinning this for later!